I sent this tape to Denmark a little while ago as part of a tape trading club. 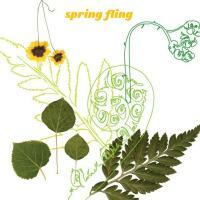 I figured I would make a springtime mix since we in Chicago were finally crawling out of the cave of winter. Spring is quite brisk here to say the least, so the songs are a mixture of happy and bittersweet. Track 3 from I Believe In You. Your Magic Is Real. Beautiful. Love the Breeders through Kate Bush and Arthur Russell -> Deerhoof bits especially.